For the fifth straight year, Informatica has been named a leader in the Gartner Magic Quadrant for enterprise integration platform as a service (iPaaS)—positioned furthest for completeness of vision, and highest in ability to execute. It accommodates any integration pattern, including: API integration, data integration, application integration, process integration, data ingestion, B2B partner management, integration hub, cloud MDM, data quality and more. It’s accessible to any user, with easy-to-use wizards, visual designers, reusable assets, and pre-configured solution templates. It works with any data and application source, featuring out-of-the-box support for AWS services, Salesforce, Microsoft Azure and Dynamics, Workday, SAP, Oracle, Anaplan, Tableau, and more. It’s intelligent, with an intelligent recommendation driven by the CLAIRE™ engine, Informatica’s metadata-driven AI technology. It’s trusted: Informatica offers compliance with comprehensive certifications across SOC2, SOC3, HIPAA, and more. To understand the enterprise iPaaS market, and why Informatica has been identified as a leader, download Gartner’s 2018 Enterprise iPaaS Magic Quadrant. 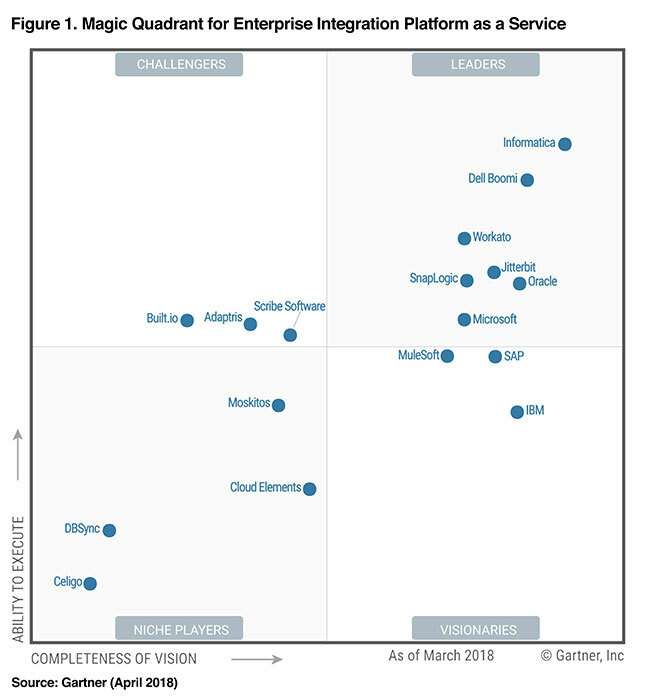 Gartner, Magic Quadrant for Enterprise Integration Platform as a Service, Worldwide, Keith Guttridge, Massimo Pezzini, Eric Thoo, Bindi Bhullar, Betty J. Zakheim, April 2018.